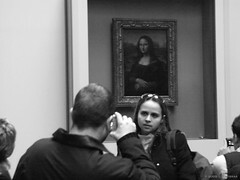 Although I've heard that the Mona Lisa was "oh so small!" & "unimpressive!" I was quite taken with the painting & stared at it for a long time. I also spent a while watching the crowds around it; everyone wanted a picture of themselves in front of the picture, to show that they were there. This woman worked her Mona Lisa smile for the camera.